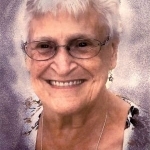 OTTAWA – Barbara Ann Hoxie, age 87, of Ottawa, passed away Monday, February 4, 2019 at Flanagan Rehabilitation and Health Care Center in Flanagan. Funeral services will be held at 7:00 p.m. Tuesday, February 12, 2019 at Gladfelter-Roetker Funeral Home with Reverend Raymond Mitchell officiating. Burial will be private at Oakwood Memorial Park. Visitation will be held from 4:00 p.m. till 7:00 p.m. on Tuesday at the funeral home. Barbara was born June 24, 1931 in Ottawa, the daughter of Andrew and Clara Barbara (Mickish) Hellman. She married Charles Hoxie August 25, 1953 in Ottawa. He preceded her in death May 15, 1971. Barbara is survived by her children, Robert (Leslie) Waggoner of Moneta VA, Lynn (Joe) Casassa of Chesapeake VA, and James Hoxie of Marseilles; grandchildren, Bryan, Cassandra, Carrie, Adam, Christopher, Jessica, Heather, and Casie; 17 great grandchildren; and 2 great great grandchildren. She was preceded in death by a son, Thomas Hoxie, and 10 siblings. Barbara worked for 20 years in Dietary Services at Community Hospital of Ottawa. She was also active in the Meals on Wheels program. Barbara loved to bake and was famous for her cookies, which she shipped all over the country to family members. She was a proud mother, grandmother, and great grandmother, and cherished her time spent with her family. Memorial contributions may be directed to St. Jude’s Childrens Hospital. To share a memory or light a candle, please visit www.gladfelter-roetker.com or Gladfelter-Roetker Funeral Home on Facebook.